Ever wondered what a thoughtful centipede would look like? Of course you haven't. But this is the best likeness you're likely to find: reclined on its back, its antennae swaying, its mandibles absentmindedly clicking, its myriad feet drumming on its chitinous belly. I just wonder what's going through that bundle of nerves it calls a brain. Something involving hunting and venom no doubt. Thanks for the centipede, Stephen. kinda makes ya just want to kiss him on the nose - he's so SERIOUS! wow, cool blog! Come check out and join Lame Owl. Said, "Pray, which leg goes after which?" It's actually not a sweater but a t-shirt under fairly high magnification. 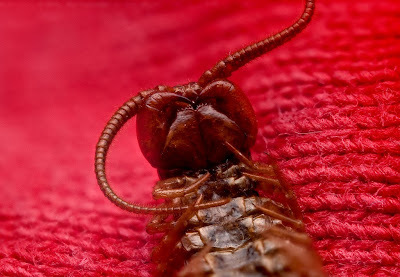 It wasn't a big centipede; sometimes ugly things come in small packages?